Hello friends – I hope you all had a wonderful weekend. It was another hot one here in Texas so aside from smoothies for dinner, my husband made us a delicious summer salad. 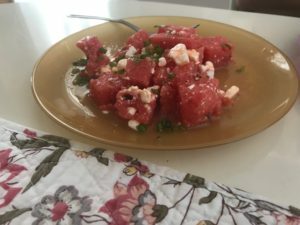 Watermelon, feta cheese, mint leaves, lemon juice and a bit of olive oil. Refreshing and delicious! As far as the books are concerned, I finished another mystery which I’ll tell you about soon. Oh and last week I did go to my mystery book group. We had some new attendees and a great discussion about The Lost Boy by Camilla Lackberg but it looks like this was not a crowd pleaser. Most thought the story was too sad and filled with too many characters and storylines. I actually did like the book a lot. I did think parts were sad but in general I liked it. Plus reading about colder places right now doesn’t hurt either. Ha. I’ve got another post I need to put together on mysteries on my radar but I was thinking that I don’t think I’ve mentioned how much we’ve enjoyed MHz Choice network. We watch a lot of foreign crime dramas and while we do find some great ones on Netflix and Amazon Prime, MHz Choice has a greater variety. We’ve watched the Fjallbacka Murders, Inspector Winter, Braquo, Tatort and a bunch of others. So if you like foreign crime shows do check this service out. And, if you area already watching it, do you have a favorite? Alright now, to get ready for the week! I’ve enjoyed the books by Camilla Lackberg that I’ve read so I still look forward to The Lost Boy. I agree that reading about colder places right now is appealing–snow in a title or on a cover attracts my interest right now. Getting away from the sweltering heat (even if only by reading) is a pleasure. Yes, I’d like to read books which has a cold setting now. We’re getting lesser rains as compared to the last few months and the humidity is making it worse. I’m curious about The Lost Boy. Hopefully our library have a copy. We had a similar salad for dinner last night, but we aren’t quite at local melons, just beginning local tomatoes (the tiny sweet ones – yum) which we put with basil and garlic and lemon juice: yum. Another couple of weeks and we’ll be eating melons too! Enjoy! Mmmm. That salad looks delicious! My husband isn’t a fan of watermelon, though, but I bet I could make a small serving for myself. 🙂 It’s warming up on the coast, but nothing like your Texas heat!